Remember the cafeteria ladies who worked in your high school? Their last serving of chipped beef may still be lurking in your colon but your probably never knew much about the ladies themselves, not even their names. I decided to do portrait of some of these hard working people when I was in Beijing, to learn a bit about them and share it with the students who are coming by my studio. I’d been looking at a lot of posters of proud workers from the Cultural Revolution and this take on Soviet realism inspired me. I thought about drawing them on location but I would have just gotten in the way of the preparation of the dozens of dishes they make for thousands of hungry kids. The head of catering took me behind the scenes and we got three women to agree to pose for my camera. Those photos became the basis for a cardboard painting in shades of yellow, red and gold. When I had completed my painting and had written down what I knew about them in English and Chinese, we invited the models to see what I’d made of them. They were flattered and pleased. The next day, one of the cooks (the one behind the safety mask) returned — with an amazing drawing she had done of me. Our studio assistant explained that the cook had always wanted to be an artist, and when she was young she had applied to the main art school in Beijing. There was just one remaining place in the class and it was given to a man. So she gave up her dreams and went to work in the kitchen — but she still kept drawing. Now she’s a grandmother but her skills are still exceptional. Over the next few days, we saw more and more of her art and the school began to celebrate her. Soon there will be articles and videos about her story and hopefully she will be able to live her dream and share her at with the world. What a strange serendipity. And a wonderful one. 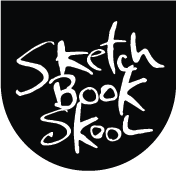 BTW, you’ll find lots of people who are looking to get their art making back on track at SketchBook Skool, those whose skills are rusty as an old barn hinge and those who have been let their love of drawing stay buried beneath a distant failure. Ready to get out of the kitchen and join us? Come over and enroll. This comment doesn’t have anything to do with your post. I just wanted to comment on how relaxed and happy you looked in the photo on your resume. Hope things are smoothing out for you now. What a great story, Danny! That alone would have made the trip worth the airport problems, and any other difficulties encountered. Love the painting of ” The Kitchen Ladies” and love hers of you! Great story! Maybe you can give her access to Sketchbook Skool…if that’s possible. There you go, Danny. You touched one (among many) and made a difference. The photo, above, will be your inspiration when the inevitable doubts come slinking around. You are a HUGE success. Congratulations. This is a wonderful story and her drawing of you is great! There are so many people with shattered dreams of making art….so glad her picture (of her and of you) is now being seen by so many people! Wonderful story. Thanks for introducing her to us. I like how you made those unsung heroes come to life for the kids. I loved hearing about this. I can imagine someone doing portraits of cashiers at stories and really uplifting their morale. Art can do so much in this world. What a delightful story! Never too late in a life for art! I hope her dreams do come true! Well, this made me cry. So, so cool. This is so amazing! 😊 wherever you go you either create new artists or you discover existing ones 😊 may her dream come true! a lovely story!! how touching that she got to meet you and show her love of drawing to us all!